This type of machine can be used on any thread trimming items, such as underwear, shirt, western cloth, western trousers, jeans, T-shirt, hat, embroidery,...etc. Especially for clothes with many ends of thread. -Table-top thread trimmer. Easy to operate. -Powerful and quiet suction motor with waste canister. -Special designed clipper blade works well and safely. Won't hurt your hands and the fabric. 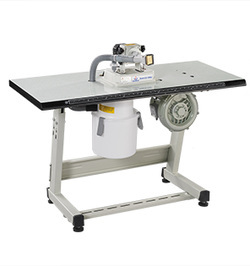 -Separately put the suction motor on the stand and the trim-waste canister under the table. Save cost.